50% discount on accommodation rates for children from 2-12 years old, when sharing double room with 2 adults. *Consecutive days of rental during period 14.06 to 20.09. “Flex” rental” during low season periods. E.g. 4 days out of 7 etc. **Third person holiday price includes accommodation and ferry round trip. 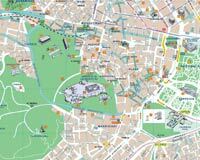 If it is worth to visit Athens for a day, then assuredly this the place to start. The hotel is situated in a great central location, 5 minutes walk to the Acropolis and main tourist area of Plaka and Psiri with numerous of great cafe and restaurants. As the name suggests, the Acropolis View hotel offers a splendid Parthenon view when you are on the balcony for many of the rooms, while the rest of the rooms offer views to Philopapou hill. Each double room has its own private balcony where you can enjoy a good breakfast – with the Parthenon only a few hundred meters away. 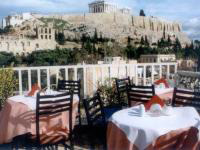 On the roof top cafe, where you will find a small bar, you can enjoy the views more of the Acropolis, by day or by night. Breakfast. Roof top bar terrace with breathtaking views of the Acropolis, Breakfast room, Free car park near by, 32 double rooms. Fully air conditioned, En Suite modern bathroom, Direct dial telephone, Music Channels, Colour TV and Fridge. The windsurfing days are scheduled on-spot and according to the weather conditions. Lesson and rental, only during the same day. All groups up to 4 persons per instructor. When the participants of the group are less than 3 people the duration of the course is being reduced. 2 weeks package includes a total of 8 out of 14 days windsurfing and a 6 days off. 1 week package includes a total of 4 out of 7 days windsurfing and a 3 days off. Round trip to Naxos with Blue Star Ferries. Prices in Euro and includes all local taxes and services. A deposit of 120,-eur per person will be required for each booking, unless this is within 4 weeks prior to arrival where the full amount of the booking is required. On our web site, you will find the holiday package prices which include the studio accommodation, the windsurf rental, the ferry round trip to Naxos and the transfer from the port or airport to the accommodation and back again, prices also includes all local taxes and services. To receive a customized offer, please submit a no obligation reservation request with your travel dates: time period, holiday duration, number of persons, children (including age), windsurf rental, courses, car rental etc. You can either book the full package or select individual components such as accomodation or only board rental and courses etc. With your reservation, which may be by email, fax or phone, you are submitting a binding offer to us to conclude a holiday agreement. The reservation made by the person placing the order shall also apply to all persons listed therein. The reservation made by the person placing the order will apply to all persons listed therein. The person who places the order is responsible for the payment of any balance of all the persons listed on the Confirmation . The holiday agreement shall become effective with our acceptance. You will receive a Confirmation of reservation from us within 48 hours after receipt of your reservation. A deposit of 120 € per person will be required for each booking. You will receive a reconfirmation from us with the receipt of the deposit. The deposit and remaining payment can be found in your confirmation of reservation. The remaining holidays price will become payable 30 days prior to you arrival date, if does not, we reserve the right to treat your booking as canceled and to charge you a cancellation charge in accordance with the table below. Payment for the reservation must be made by bank transfer or by credit card. If you cancel or change your holiday agreement or windsurf activities booking or fail to undertake the trip to Naxos or if your holidays are cancelled due the follow events: strikes, war, threat of war, riots, civil disturbances, terrorist activity, industrial disputes, nuclear disasters, fire, earthquakes, epidemics, health risks or any other similar events, we will demand compansation for the travel preparations and for any financial losses. Cancellation fees are calculated and will be applied as follows. IN THE CASE THAT WE CANCEL YOUR HOLIDAY PRIOR TO YOUR ARRIVAL. UNDER EXCEPTIONAL CASES AND IF WE ARE NOT ABLE TO OFFER SOME SERVICES we reserve the right to cancel your holiday package or any of its components or replace with equivalent/similar standard and price (if available). You may either accept the new arrangements offered or cancel your holiday and receive a full refund . 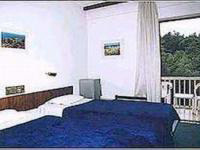 Prices are based on accommodation in standard twin/double-bedded rooms unless otherwise stated. We accept request for certain rooms but these cannot be guaranteed. The accommodation we arrange for you must only be used by those people named on your Confirmation You are not allowed to share the accommodation or let anyone else stay there. All accommodations include bed linen and one bath towel and one hand towel per person but these are not allowed to carried out to the beach. Photographs of rooms represent the type of accommodation available, but view from the room or furnishings may will vary. Our holiday packages usually include domestic ferry or flight trip to Naxos. You will receive the ferry or flight tickets to the email account you have given us. We take no responsibility for delays or changes due to rescheduling or cancellation of ferry/flights by a ferryline/airline or due severe weather conditions, alteration of the ferry/aircraft, closed or congested ports/airports and any other similar events. 1) The Client is using equipment at his own risk of accident or injury. 2) Equipment is in use only by the Client. 3) Equipment is provided for use by the water only, therefore the Client cannot hold the equipment on the beach or carry it anywhere else, or launch/land at any other spot except at the launch site in front of the surf centre. 4) The Client should follow the local and National regulation of personal watercrafts. 5) We reserve the right to limit the windsurf activities we offer during extreme weather conditions and according to the Client’s ability and experience. It is within our absolute discretion to refuse any Client’s request to use the equipment during extreme weather conditions where we consider the Client to be at risk. 6) EQUIPMENT DAMAGE INSURANCE is offered locally or pre-booked. Unless the Equipment Damage Insurance is valid, any damage on the rented equipment will be charged to the Client. A credit card with sufficient balance may be requested as guarantee. 6.4) Equipment is provided for use in recreational sailing. We reserve the right to void the insurance if the equipment is being used in a destructive way or if the renter does not possess the necessary skills to use the equipment. In this case the insurance fee will be refunded and any damage which may occur on the equipment will be charged to the Client. 7) Please note that NO refunds will be given for cancellation from windsurf activities in case of non participation due to illness, injury, lack of wind or any other reason. We offer holiday to windsurfers. With the exception of children, our wish is to have a minimum ratio of one to one windsurfers to non-windsurfers..